I had a dream two nights aga, my mocs were made for TWO left feet. OLChemist and windanncer like this. That's why yer winnin all them Cali comps ! 2 left feet ! Homie ^^^ doesn't even know what a mock is! Isn't that what the hairlipped guy puts on his shed to keep people out ? mock ??? It seems I made mocassins for someone who has a left foot on the right leg and a right foot on the left leg. At least I know now, that I need an angle between center line and the pattern which shall centered on the toe. It is at the sewing line about the width of at least one index finger or may be one and a half finger . Right moc one to the left and left moc to the right from center. Looks like as if I have just to do another pair of uppers to get it right. In my opinion , it's not that far off and would not be overly noticeable on a finished pair. That said , it's up to you. Every pair will see an improvement ! OLChemist, windanncer and Broken Arrow like this. If you cross your eyes...it looks alright. wardancer, windanncer and Broken Arrow like this. Thank you wardancer, I finish the pair and keep it. Estimate it takes me to Friday afternoons to finish the second moc. The Friday afternoons are reserved for beading and handwork. 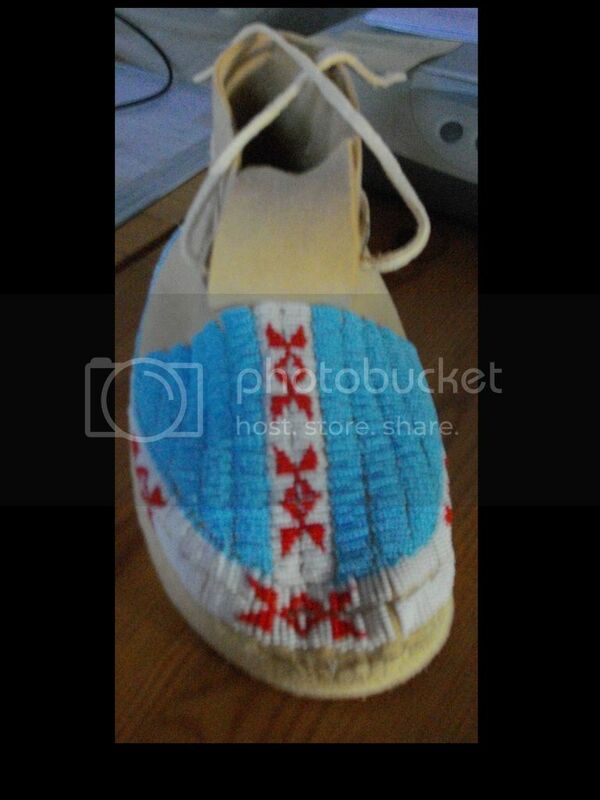 Yes improvement with every pair is accomplished but the occasions to wear such beaded mocassins are meager over here. Said that, I like to do the handwork and learn that art of craft. I question myself, what shall I do with them if I pile up a heap of mocassins? Hiding them would be a shame. And on the archery ground the plain mocs will last me at least six years. The pair I wear last year will make another year. On grass and forest floor they are very comfortable. Within certain range it does not matter what other think though I might be considered far more crazy then I am already considered now. About all this modern gadgets all to often good old techniques and handwork is ignored. Ah Joe's Dad, no problem with my eyes to cross them. I question myself, what shall I do with them if I pile up a heap of mocassins? Hiding them would be a shame. And on the archery ground the plain mocs will last me at least six years. The pair I wear last year will make another year. On grass and forest floor they are very comfortable.They make good gifts !I have 2 pair of my own , but I make a lot for other folks. One pair I have were made by my Grandmother around the time I was born. I've had them over 30 years and re-soled them 4 times ! Joe'sDad has special talents ! He can cross his eyes and squint at the same time ! And he can do it while jammin' to Northern Cree ! four to five days including beading, wow. I need at least four Friday afternoons 14:00 to 18:00 only for sewing. Better slow and improving then fast and sloppy. Errors are quick and easy made. The patterns in the craft manuals do not tell all about how to do it more swift. Better slow and improving then fast and sloppy. Dang , are you sayin' mine are sloppy ??? Jesus Christ, of course not. I assume you have years of practice, learned from your errors and guided by relatives and now can do it without looking in the way I have seen a knife grinder doing grinding after 60 years of practice in a manufactury at Solingen. He talked about getting practice until he could do it almost without looking, alt least he let look it alike. I am the sloppy one at this stage when doing faster. Getting better slow will improve speed in the long run. But perhaps I do not want to get faster or more likely to get to fast. The value of doing the work itself may shrink. In this form I believe partly in the route is the goal. There have been times, when reaching the final goal, there was joy about accomplishing the goal and in the same time much sadness about reaching the goal because the particular journey on that route had found an end. They make good gifts !I have 2 pair of my own , but I make a lot for other folks. One pair I have were made by my Grandmother around the time I was born. I've had them over 30 years and re-soled them 4 times ! Indeed they are great gifts but there aren't people around here at the moment which could appreciate such a gift in your terms, not even in terms of the wasichu. That gifts would be a wasting. It is like given a selfmade stone arrow head to an archer who throws it away. My mocs are about shoe size 10. Minnetonka size 10 fits. Other brands of shoes may vary from 9 1/2 to 10 1/2. Shoe size 43 to 44 over here. Industrial manufactured shoes vary from year to year in size called out as 43. Probably only the ruby slippers ! I can't find their picture on the board. Perhaps there is coyote around. No, they are not sloppy crafted. Ok, Ruby would not be my choice but that choice is anyone own taste. Have not gone far enough back in time in the thread. I have seen a lot of fine work done by you there. Last edited by Broken Arrow; 03-13-2017 at 10:59 AM.. Reason: not had disappeared through miracle!